Super Mario Galaxy 2’s gameplay is superb, having some of the most creative level design I’ve experienced. Discovering the new rules and parameters of each galaxy is a joy. Yoshi is back. There’s a variety of suits that are available like the Cloud Mario and Rock Suit that mix up the control scheme and the paradigm behind each level. The gameplay is an evolution of Mario’s rich past, varied and sumptuous. Lead Programmer, Takeshi Hayakawa, created a Mario Maker-style level creator for Galaxy so that all the developers could design their own worlds. I could feel the fun they were having as they pushed both the boundaries of gameplay and gravity itself. Some of my favorite worlds in Galaxy 2 were when they built on the connection with that past to construct something totally new, especially with its throwbacks to Super Mario Bros. 3. Super Mario Brothers 3 was my favorite 2D Mario (with Mario World coming in a close second) in large part because of the suits. There were just so many good ones, from the Raccoon Mario that let you fly, to the Tanooki suit which was similar to Raccoon but could also turn you into an invincible statue. I also really dug the ability to become an actual Hammer Brother and toss arcing hammers. The powerups made it possible to change the rules of a level and tackle any stage in a unique method. In Water Land, the frog suit makes some of the more difficult liquid levels easier to navigate, thanks in large part because the powerup grants superior swimming skills. This is helpful in the second fortress against the ghost Stretches, the long rectangular stripes of death you have to swim past without crashing into. There’s also Kuribo’s shoe which not only helps you stomp enemies more effectively, but makes Mario impervious to the spikes and baby piranha plants that line the surface. SMB3 was nifty in that you could carry the different suits and access them whenever you wanted. Nintendo had taken the base gameplay from the original Mario and transformed each stage into a gameplay canvas you could tackle in numerous ways via the suits. I tried invading the airships in just the frog suit and it was not only one of the hardest things to do in SMB3, but it felt like I was playing a different game as the physics were so different. The fine-tuned physics are key to what has made the Mario series stand out. The jumping, the acceleration, and the motion feel just right and was part of creator Shigeru Miyamoto’s intuitive grasp of player friendly controls. To this day, I feel Metroid Prime has some of the most natural jumping in a first-person game. I mention this story to illustrate Miyamoto’s gift for honing what Miyamoto described as gameplay’s 3 C’s. The Camera, Character, and Control feels natural and intuitive in Super Mario Bros. 3, and that dedication to detail finds near level design perfection in the individual galaxies of Galaxy 2. Aside from the powerups, there are many throwbacks the Galaxy games make to concepts that were first introduced in Super Mario Brothers 3. This includes the airships Bowser and Bowser Jr. ride, the letters Princess Peach sends to Mario, and even the map layout on the second Galaxy. I was overjoyed, then, when in the fourth world map’s first galaxy, you come across the Supermassive Galaxy. Super Mario Bros. 3s 4th world is similarly a Giant Land where everything comes supersized. I remember being fascinated seeing iconic enemies like goombas and paratroopas supersized. The geography dwarfed Mario and I appreciated the fantastic and experimental nature of Mario. The core physics are still the same. The enemies can be stomped and even the large ? boxes can be pilfered for coins. In SMB3, 4-6 even uses the mechanic of a magic door to incorporate size changes into the gameplay. Many other games had ocean stages and desert ones like the previous two I’d visited in Mario 3. But Giant Land made me feel like I’d entered a strange world full of Mario giants. It remains, for me, one of the most memorable areas of the NES era. 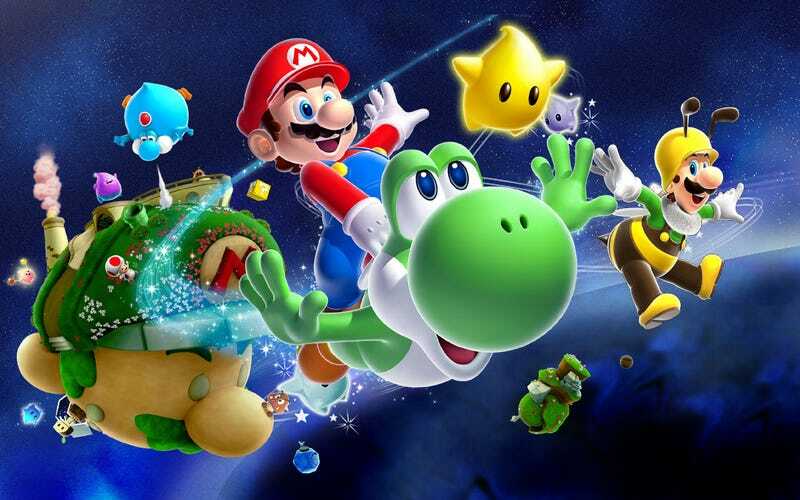 Galaxy 2’s nod to Mario 3, as well as Super Mario 64’s Tiny-Huge Island, is a blast. The goomba you first face is massive, stomping slowly about. The pipes resemble skyscrapers in size. The Stone Tube Planet you have to race through is a gigantic cylindrical maze made of stone and overrun by Giant Wigglers that necessitate speed and balance as your perspective turns. Speed running through the giants for one of the power stars is a tense race that I still haven’t been able to master (need to work on that power jump). Fortunately, there’s also a cheat on Big Koopas Planet within the Supermassive Galaxy that seemed like a throwback to the original Mario game where you can exploit the Koopa Troopas for 99+ lives by jumping repeatedly on them. What’s key is how much fun Galaxy 2 was, both for me, as a long time Mario fan, and newcomers like my wife, who hadn’t previously played any of the 3D Mario games. I played through the entirety of Super Mario Galaxy 2 with her and we both marveled at the gameplay. Galaxy never rests on its laurels and remixes its own rules to subvert, even rebel against previously established design choices. We switched Wii remotes every other level as the second player controls the Orange Luma. The Luma could collect star bits, activate checkpoints, and most importantly, paralyze enemies by pushing the A button. In the case of the Koopa Troopas in Supermassive Galaxy, with the second player holding them in place, it became very easy to bounce on their shells until I’d accumulated way too many lives. Most of the individual galaxies have three missions available, encouraging multiple revisits with shifted emphasis from trial runs to music based conundrums. Every galaxy asks a question and Mario has to struggle with its implications as he formulates a triple-jump based resolution, hopping from planet to planet, galaxy to galaxy. The answer is almost always accompanied by a sense of joy and wonder, a feeling I shared both as a younger gamer playing Super Mario Bros. 3, and as a much older one skipping across Super Mario Galaxy 2. That’s because Mario games are at their best when they make us feel like kids again, exploring the universe for the very first time, puzzled, then slowly beginning to understand the mysteries it throws at us until we’re able to overcome.